UPDATE: Ouch! 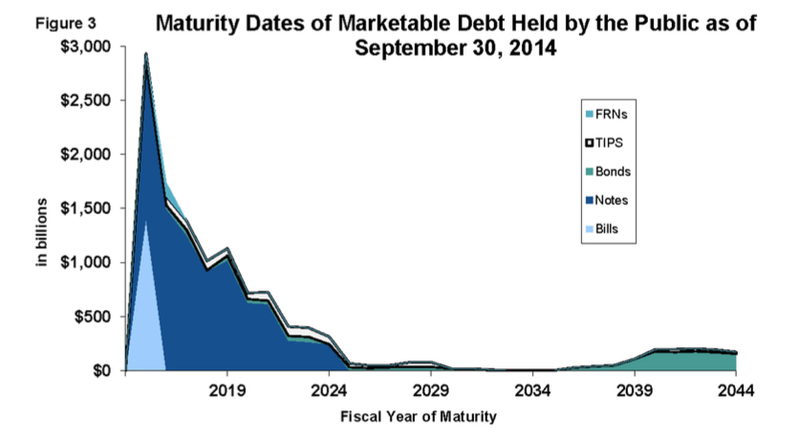 How much will UST debt service go up when Fed Funds get bumped? The U.S. Treasury debt is fairly short in duration (see the graph below). When interest rates move up, what will happen to the cost of servicing the debt? An article in today’s WSJ (link for subscribers) notes, “An extended surge in yields could jeopardize growth as it would lead to higher borrowing costs for consumers and businesses.” Unmentioned in the article and undiscussed by the Fed in the elephant in the index–sorry, I meant the elephant in the room: the enormous and short-duration U.S. Treasury debt. A surge in yields will create a surge in debt service, and additional demands for either more borrowing or more taxes to simply service the existing debt. 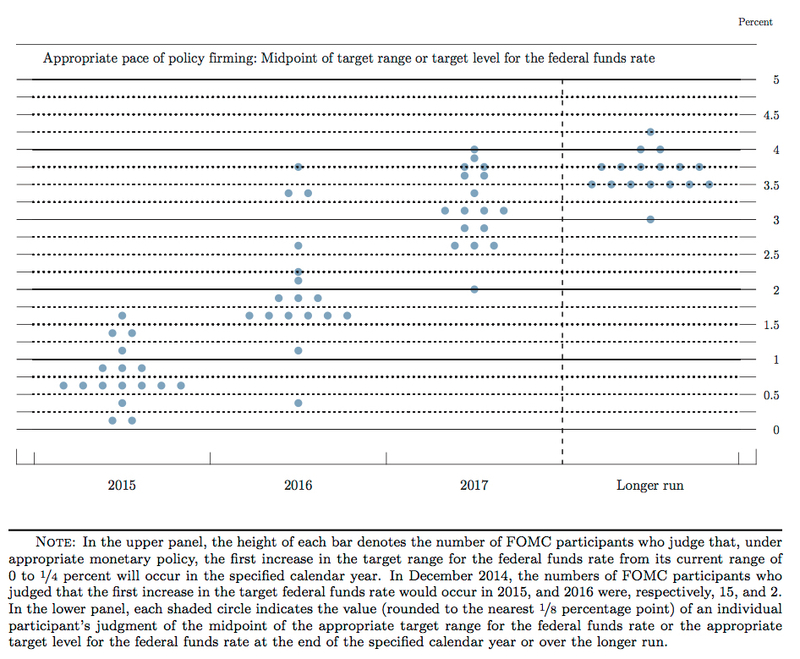 The FOMC seems to be doing a better job of helping to manage the fiscal challenges than Congress–so it would seem they are aware of this and will be reluctant to ratchet rates too far because of the flow through effects on the economy. When rates begin to move, as maturing debt is rolled over, the debt service costs will start to move almost immediately. What if short rates move 100 basis points? How about 200 basis points? Due to the short duration profile of the debt, an increase in short term rates will begin to affect debt service costs very quickly. What will the increase in debt service costs do to the already negative Federal budget? Borrow more? Raise taxes? What will be the impact on the (fragile) economy? And to stocks? Chart is from Treasury Direct, GAO-15-157 Schedules of Federal Debt, Page 19. Note also that this is only the marketable debt–it excludes the $5 trillion+ (as of 9-30-14) of Intergovernmental Debt Holdings. This does not lead me to suggest that bonds should be avoided–but that investors with an appropriate weighting in bonds should be cautious in selecting maturity dates. This is a topic that has not received any attention yet. My guess is that it will start getting headlines about 30 minutes after the next Presidential election. Comments? What do you think? Rate hike sooner? Later? This year? Next year? There are so many variables at work, forecasting rates with precision is not realistic. Yet waiting for higher rates remains very popular. However, by underallocating to bonds, investors may unwittingly be taking on more risk by missing out on the diversification benefits of holding bonds with their stocks. We believe it is unwise to try to time interest rates, and suggest instead to mitigate the risks of a rising rate environment by adjusting within fixed income (which specific investments you own), rather than shifting your asset allocation. For investors, use your investment policy to determine your asset allocation. Your market view should affect which investments you select–not whether or not you remain invested. Click here to read more about timing rates. NEW book added to my list! NEW! (Entry added May 20) Encyclopedia of Municipal Bonds, by Joe Mysak has recently been published, and is a worthwhile addition to the bookshelves of municipal bond market participants. Click here. Summer Redemption Season is about to start! Municipal bond investors should be sure that they are prepared for the spike in redemption activity that is expected in June ($37 billion) and July ($21 billion). Read the latest article to learn more.